Current: What are Scrum Ceremonies? A powerful scrum software that supports scrum project management. 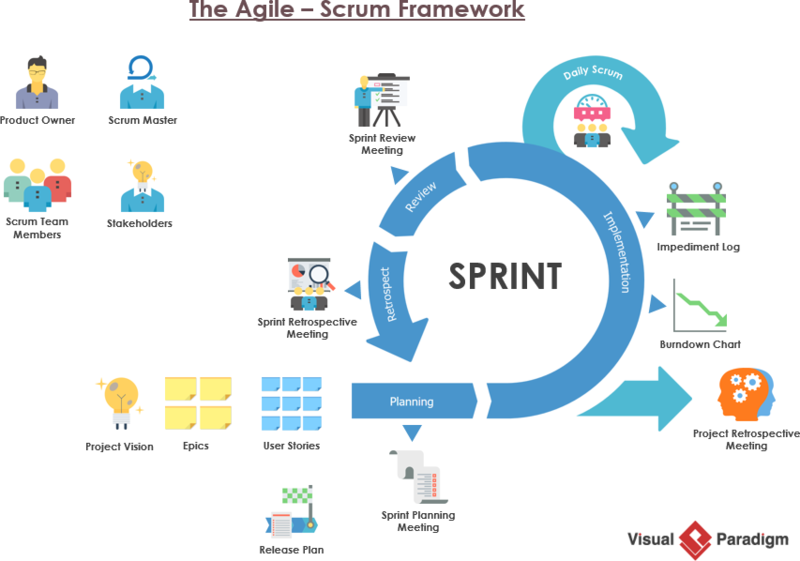 It features scrum tools like user story map, product backlog management, sprint backlog management, task management, daily scrum meeting, sprint planning tool, sprint review tool, sprint retrospective tool, burndown, impediment, stakeholder and team management. Each Scrum Project could have multiple Release Cycles and each release could have multiple sprints. There are a number of repeating sequence of meetings, to be held before, within and after the sprint cycle. Product Backlog refinement is the act of adding detail, estimates, and order to items in the Product Backlog. This is an ongoing process in which the Product Owner and the Development Team collaborate on the details of Product Backlog items. During Product Backlog refinement, items are reviewed and revised. As mentioned above, Product Backlog refinement is an ongoing activity, and unless it is being conducted at scale it does not restricted to be a time-boxed event (or meeting). However, there is nothing to stop teams from time-boxing each refinement session anyway. In general it is good practice to use time-boxing. The goal of Sprint Planning is to answer the questions “What are we going to work on, and how are we going to do it?” It’s also important for the team to have a shared goal and a shared commitment to this goal before beginning their Sprint – the list of items the team plans to work on during that specific Sprint. The team then breaks down these items into tasks, typically no bigger than a 2 days’ worth of work. Once we begin a Sprint, we have what we call a Daily Scrum every day. Organized by the Scrum Master, Daily Scrum is typically a 15-minute stand-up meeting to synchronize the work of team members, i.e. what’s done on the prior day, what needs to be done today, identify any impediments, and creates visibility around the work that everyone is doing in the Sprint. At the end of the Sprint, the goal is to have a Potentially Shippable Product Increment (PSPI). We’re trying to get something of incremental value done every Sprint. Held at the end of each sprint to demonstrate the added functionality. The goal is to get feedback from the product owner and other stakeholders to ensure that the delivered increment met the business need and to revise the Product Backlog based on the feedback. This feedback will then become items that will be looped back into the Product Backlog, where it can be ordered and pulled in by the team in a future Sprint. Retrospectives typically last 90 minutes and are there to help us incorporate continuous improvement into our team culture and into our Sprint cadence. This is where the Scrum Team meets to reflect on their previous Sprint and to figure out how to improve as a team by asking – what went well, what did not and what can be improved. It allows the team to focus on its overall performance and identify strategies for continuous improvement. Scrum ceremonies to be embedded in the process create a cadence in which the team can maximize their productivity, promote collaboration, maintain transparency, and most importantly, inspect and adapt on the way they go, so that they can continuously learn and improve from each other. Visual Paradigm help organizations stay competitive and responsive to change faster and better in today’s fast changing environment. Our award-winning products are trusted by over 320,000 users in companies ranging from small business, consultants, to blue chip organizations, universities and government units across the globe. 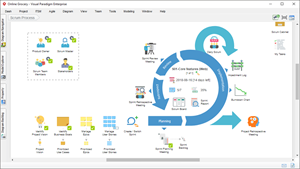 It enables organizations to improve business and IT agility and foster innovation through popular open standards and process frameworks.Visual Paradigm, a killer Agile feature in 2018, introduced Scrum Process Canvas for automating the way a Scrum team to create, manage and deploy software application that empowers the team to continuously improve their performance at unprecedented speed and scale. Automate the Scrum Framework in a fun and enjoyable dashboard with eye-catching updated status. Automate the Scrum events and related activities with self-explanatory instructions, samples and required document templates.